The creator of this website is a manga otaku (yes, in the pejorative sense). 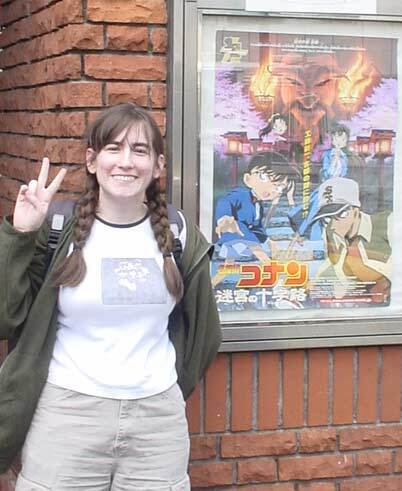 I've been a big Conan fan for only the last four years of the manga's ten year run. It is now currently my favorite series that is still going, and in my opinion one of the best works of art in existence. Detective Conan was the keystone of my college thesis on narrative techniques in mainstream shounen manga (boys' comics). Essentially, Conan is the only series I'm following excitedly at the moment. I had a Conan page on a personal webpage, but I wanted to do something public. I had already begun construction when I heard that Conan would be released in America. This site was made with an html editor but primarily hand-coded, all pictures, graphics, etc. were scanned from original sources by the webmaster, created by or at the behest of the webmaster. Of course all material from original sources is the property of Aoyama Goushou, Shogakukan, Touhou and any other rightful owners. This site is intended to inform present and potential Conan fans about the manga. Although this site is unauthorized, the use of manga related visuals is intended to foster an interest in supporting Aoyama Goushou and other related parties through generating interest in the original Japanese comics, and any potential English release (of the comic). It isn't much, but I list all the manga I own and information about each of them (descriptions, translation companies, total volumes, etc.). Also comes with a cover picture of all 76 series, so it may be slow loading for some people. Oh, it's also in order by kana. I did a version of it in iroha order, too, but thankfully I'm not posting that.